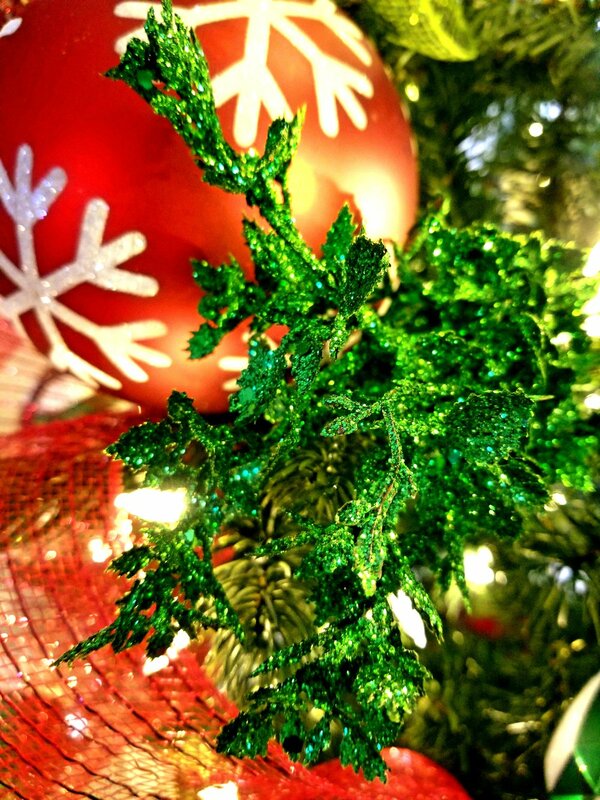 Dec 2 5 tips to make your holiday tree look AMAZING!! 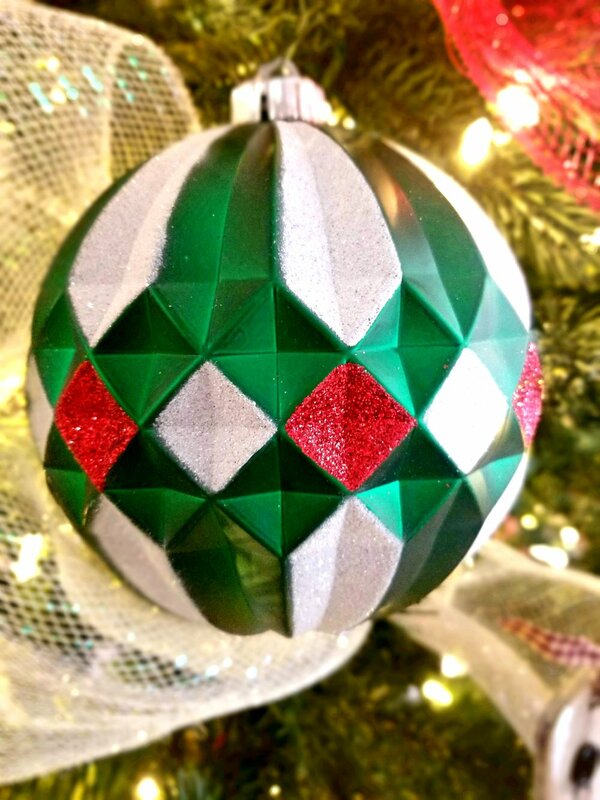 Are you looking for holiday decoration inspiration? Splash of Joy is here to help! I purchased this 7.5' Alberta Spruce tree with LED lights online on Cyber Monday. You can usually find some really great deals on these trees online. The nice thing about artificial trees is that you can pull them out any time, for any occasion, and they always look perfect. I love that I can bend the wired tree branches too. This is especially useful when working with Deco Mesh. Make sure to bend these branches, not those branches. Gather and pinch the Deco Mesh with the tree branch. Repeat across the tree until it's covered. I like working in a diagonal swirl down the tree, but you could also just work from top to bottom in a straight line. Once you reach the bottom, just cut the Deco Mesh where you need it to stop. I purchased my jumbo ornaments from Costco, but I'm sure you could find them online as well. I believe my ornaments are 5.9" and shatter resistant. I scored the large glittery ornaments at the local dollar store. Once you have all of your ornaments placed, add some fun holiday florals. You can usually find them at your local craft store. Keep the floral stem on and just pop them right into the tree! Periodically take a step back and make note of the color arrangements and spacing between your flowers. I love to add a splash of glitter and sparkle to my tree. I found these little picks at my local craft store and they were under $1 each. 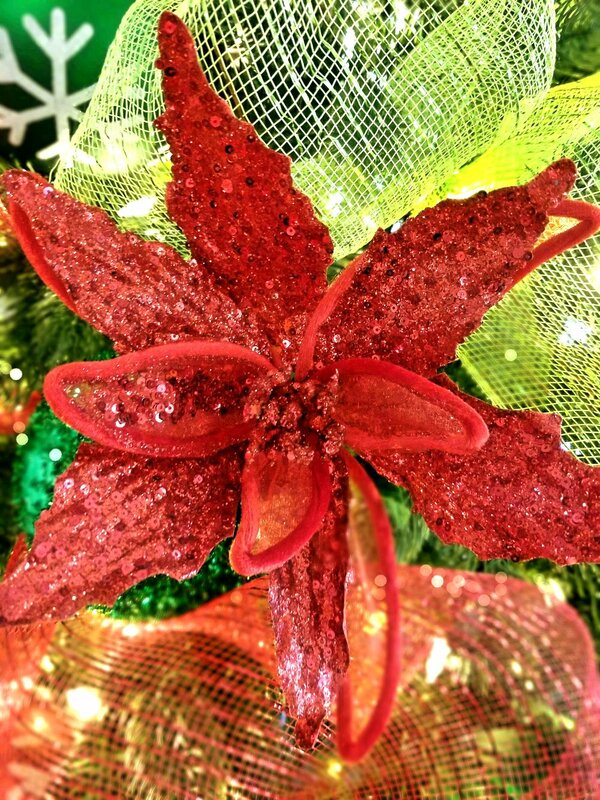 Spruce up the top of your tree by adding some holiday flowers or leaf stems. I personally love the look of these glittery leaf stems. I added some fun swirly stems and a green glittery leaf stem bundle for contrast. I also added one unique ornament (the large Christmas bulb) as a statement piece for the tree top. And that's it! Super easy and so beautiful! Hope you enjoyed the read and I hope that this gave you some inspiration to make your holiday tree look amazing this year! Stay tuned for more holiday DIY projects by Splash of Joy!